What Is Schoolwide Enrichment? And How Do Gifted Programs Relate to Total School Improvement? This article may be reproduced, distributed, and forwarded to others electronically without permission. The work reported herein was supported under the Educational Research and Development Centers Program, PR/Award Number R206R50001, as administered by the Office of Educational Research and Improvement, U.S. Department of Education. The findings and opinions expressed in this report do not reflect the position or policies of the National Institute on the Education of At-Risk Students, the Office of Educational Research and Improvement, or the U.S. Department of Education. With accurate experiment and observation to work upon, imagination becomes the architect of practice. Over the years we have been asked countless questions about the purpose of the Schoolwide Enrichment Model (SEM). Is it a model for gifted programs? Is it a model for general school improvement? Will it water down services to the gifted if you try to extend services to more students? How does SEM deal with the “profoundly” gifted? Are you saying that all students are gifted? How does the model deal with underachieving (unmotivated, non-creative, at-risk, twice-exceptional, etc.) gifted? Does the SEM involve grouping students by ability? By interest? By both ability and interest? How does acceleration fit into the SEM? If we are using SEM do we still need a gifted program? Isn’t the SEM just a politically correct way of dealing with the question of giftedness [or equity, or inclusion, or irritated parents, or anti-gifted teachers or administrators]? Is it true that the SEM is just a way to save money? Is it true that SEM programs are far more expensive than other kinds of programs? Is the SEM just for elementary schools—what about pre-school? Middle school? High school? Won’t “differentiation” take care of every student’s needs? The list goes on and on. And critics of the SEM have taken more than a little liberty in adding their own surplus interpretations to the purpose and meaning of the model. The answers to these questions and interpretations are both simple and complex. An attempt was made to address some of the above questions and commentary by other writers in an article entitled Reflections, Perceptions, and Future Directions (Renzulli, 1999b). The structure and implementation procedures used in the SEM—the “how-to” of the model—have been described in detail elsewhere (Renzulli and Reis, 1997a; Renzulli and Reis, 1997b). This brief article discusses what the model is and the major goals toward which the SEM is directed—the big picture, so to speak! These larger concerns are important for both current users of the model who need to answer questions such as the ones raised above, and for prospective users who should consider the big picture before making decisions about whether or not SEM is the best choice for their school or program. We will begin by briefly describing, then describe schoolwide enrichment and conclude by examining how the SEM relates to total school improvement. What is the Schoolwide Enrichment Model? 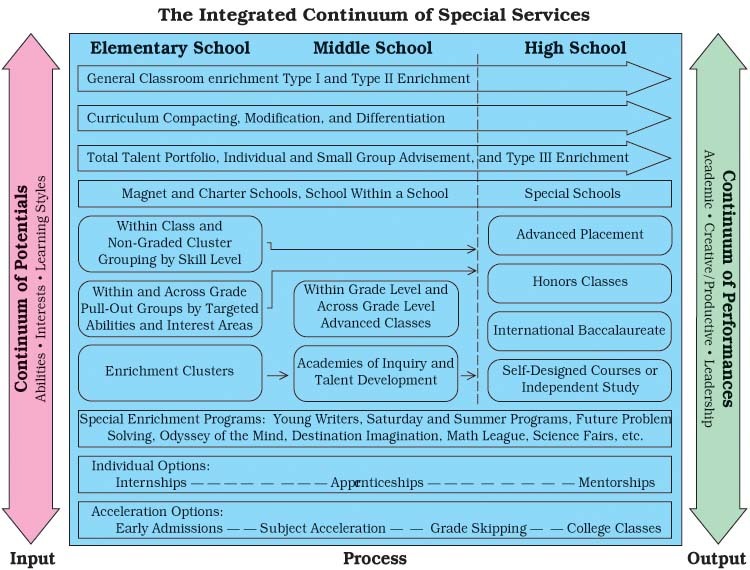 The Schoolwide Enrichment Model is an organizational plan for delivering enrichment and acceleration through an integrated continuum of services (see Figure 1). The word “integrated” is emphasized because maximum payoff is achieved when a service provided through one component of the model enables students who show superior performance or advanced interest to escalate their experience through options that might be available through other service delivery components. Services provided by the model range from general enrichment for both wide-ranging and targeted subgroups to highly individualized curriculum modification procedures for rapid learners and first-hand investigative opportunities for highly motivated individuals and small groups. The model also includes a broad array of specific grouping arrangements based on commonalities in abilities, interests, learning styles, and preferences for various modes of expression. Services based on the Enrichment Triad Model form the core of the enrichment dimension of the SEM, but the model also includes various acceleration options (e.g., grade skipping, enrollment in college classes) and numerous supplementary program options that provide opportunities for talent development in specialized areas (e.g., Math League, Invention Convention, National History Day Competition, to mention only a few of the hundreds of available options). Other components of the model include performance-based assessment of student strengths, individual and group counseling, and various special placement options (within and outside the school) based on high degrees of proficiency and potential. Figure 1 provides a graphic overview of the integrated continuum of services. The arrow on the left-hand side of the figure, Continuum of Potentials (Input) is intended to convey the broad range of abilities, interests, and learning styles that exist in any population and subpopulation of students. Even in highly targeted groups (e.g., advanced math students), there is always a range of abilities, interests, and learning styles, and this range requires that differentiated learning experiences must be provided to accommodate individual differences. Although it has become somewhat of a cliché, there are in fact as many differences in a selected group of students as exist between gifted students and the population in general. The arrow on the right hand side of Figure 1, Continuum of Performances (Output) is intended to illustrate the range of performances and modes of expression that will result from differentiated learning experiences. When considering this range of performances, we should take various modes of expression into consideration as well as levels of ability. Graphic, dramatic, artistic, spatial, and other forms of expression should be considered in addition to traditional written and spoken expression styles. We should also take into consideration various levels of evaluation criteria when providing feedback related to student achievement and creative productivity. Traditional, norm-referenced evaluations (e.g., test scores, letter or number grades) may suffice when evaluating standard and advanced lesson learning activities, but creative/productive products need to be considered by using alternative modes of assessment [see, for example the Student Product Assessment Form (Reis & Renzulli, 1982)]. And the assessment of creative products should always take into consideration evaluation by internal criteria of what is important to the creator (Bloom, 1956) as well as external criteria that focuses on how others will evaluate one’s work. Placing value on internal criteria helps students develop a sense of what they think is important and unique about their work. We would not, for example, foster the uniqueness of a writer such as Langston Hughes if his writing was evaluated with the external criteria typically used to evaluate standard prose. The center section of Figure 1 (Process) represents many of the organizational methods for delivering services to students. An important consideration is that any and all services provided through various organizational approaches are integrated or interconnected so that an experience in one organizational setting can be capitalized upon by connecting it with options from another organizational component. Let us assume for a moment that one component of a comprehensive program offers general enrichment for all students in the regular classroom. Let us further assume that two or three students have had a remarkably positive reaction to, for example, a Type I (general exploratory) presentation and demonstration on robotics. We might want to form a special enrichment cluster for these students, or arrange for a mentorship experience, provide them with Internet access to explore robotics, or information on a national or international robotics competition. The most advanced students might subsequently be provided with a summer mentorship experience on a college campus or in an internship at a robotics manufacturing company. Another example of integrated services deals with the most advanced students in a particular subject area. Let us assume that there are eight or ten primary age students across two or three grade levels that have demonstrated extremely high achievement in mathematics. Classroom teachers should ideally be providing curriculum compacting services for such students, and teachers should be using the time gained through compacting to provide within-class acceleration and mathematics enrichment opportunities. But equally important is the need to arrange a special grouping situation that allows these students to interact with their mathematically able peers on a regular basis. Both compacting and cluster grouping will be further enhanced if the classroom teachers and the person(s) providing instruction to the special group are in close communication about the respective activities in classroom and special group situations. These few examples of integrated services from the continuum presented in Figure 1 are little more than common sense; and yet a good deal of the time and energy of previous decades has been devoted to arguments about the supremacy of one approach over all others. It is our hope that emphasis in the future be devoted to answering questions about how we escalate learning options for our most potentially able students within and among interconnected services rather than what is the one best approach to providing for the gifted. It is also our hope that there will be an integration between and among the three main considerations of special programming—identification (Input), programming (Process), and output (Product). One of our biggest challenges for the future is to create logical and defensible relations between where and in which ways a young person is “located” on the continuum of potentials (identification) and how this information can guide us in making the most appropriate decisions for maximizing this person’s assets (programming). The Schoolwide Enrichment Model applies the know-how of gifted education to a systematic plan for total school improvement. Based on the belief that “a rising tide lifts all ships,” our goal is to increase challenge levels for all students and to promote an atmosphere of excellence and creativity in which the work of our highest performing students is appreciated and valued. This plan is not intended to replace existing services to students who are identified as gifted according to various state or local criteria. Rather, the model should be viewed as an umbrella under which many different types of enrichment and acceleration services are made available to targeted groups of students, as well as various subgroups of students within a given school or grade level. And the plan purposefully creates specific types of involvement for the entire faculty of a school in order to: (1) utilize the many and varied talents that exist on any faculty, (2) provide a vehicle for the development of the faculty’s gifts and talents, and (3) minimize the “us-and-them” mentality that existe in many places where efforts are not made to create specific vehicles for bridge building between special and regular program personnel. The centerpiece of the model is the development of differentiated learning experiences that take into consideration each student’s abilities, interests, learning styles, and preferred styles of expression. The overall mission of the SEM is to escalate the level and quality of learning experiences for any and all students capable of manifesting high levels of performance in any and all areas of the curriculum. As part of this mission, the model provides guidance for the development of challenging and appropriate educational opportunities for all young people, regardless of differences in demographic and economic backgrounds or differences in the rates, styles, and levels at which they learn. We believe that true equity can only be achieved when we acknowledge individual differences in the students we serve, and when we recognize that high-achieving students have as much right to accommodations in their schooling as do students who are experiencing learning difficulties. We also believe that equity is not the product of identical learning experiences for all students; rather, it is the product of a broad range of differentiated experiences that take into account each student’s unique strengths. The SEM is based on a broadened conception of giftedness (Renzulli, 1986; Renzulli, 2000) that focuses on the many kinds of aptitudes, talents, and potentials for advanced learning and creative productivity that exist in all school populations. The goal is not to certify some students as “gifted” and others as “non-gifted,” but to provide every student with the opportunities, resources, and encouragement necessary to achieve his or her maximum potential. In the SEM, the “language” of the model is that of labeling the services, not the student. Examples of labeled services are: a special mini-course for all fourth graders in how to access the Internet; an advanced placement course in chemistry; a multi-grade cluster group in mathematics for high-achieving students; a special enrichment cluster for all students interested in filmmaking; assigned time in a resource room to work on a research project; and curriculum compacting for students who have already mastered the material to be covered in an upcoming unit of study. We believe that the many and diverse talent potentials of young people can be enhanced through the broad continuum of services described earlier. These specified activities might take place within regular classrooms on an individual or small group basis, in special grouping arrangements that are purposefully formed because of advanced achievement levels, high levels of interest in particular subjects or problems, or strong motivation to pursue the development of a common product or service. Advanced opportunities can also take place outside the school in special internship or mentorship situations, in magnet schools or special-theme high schools, at cultural institutions, in summer programs or programs offered by colleges or universities, or anywhere else where highly capable and motivated youth can gain knowledge and experience that is not ordinarily available in the regular school program. We also believe that all regular curricular material should be subject to modification according to the learning rates and learning styles of individual students. A total talent development model should give special consideration to schools that serve young people who may be at risk because of limited English proficiency, economically limited circumstances, attendance at poor-quality schools, or because they just learn in a different way from the majority. We believe that it is in these schools and among these student populations that extraordinary efforts, indeed heroic efforts, should be made to identify and cultivate the high-level talents of young people, talents that historically have gone unrecognized and underdeveloped. A Specialist in Every School. For as long as we can remember, there have always been five main goals that have guided our work. The first goal is that there should be at least one enrichment specialist in every school in the world! Although this is obviously a very ambitious goal, we will not develop the gifts and talents of our most potentially able young people unless there is a person(s) on the faculty of every school who has the task specific responsibility and specialized training that will guarantee that certain highly targeted services are provided. Just as all teachers are capable of teaching “a little art” or “a little music” or “a little physical education,” we also know that these specialties can only be covered in advanced ways when a well trained person with a focused commitment provides opportunities, resources, and encouragement that are above and beyond what most classroom teachers can provide. [Note: The specific responsibilities of the enrichment specialist in SEM programs have been described in Schools for Talent Development (Renzulli, 1994)]. We also believe that unless the enrichment specialist is guided by a logical but practical model, whether it be SEM or another model, a program is almost always in imminent danger of ending up being a random collection of haphazard activities that are subject to the whims of uninformed decisions makers, impromptu practices, or the latest flavor-of-the-month fad that a self-proclaimed expert has said is “good for the gifted.” Although having an enrichment specialist in every school has budgetary implications, we have always told administrators and boards of education that a specialized service that is the responsibility of everyone inevitably ends up being the responsibility of no one. If we want to see our most potentially able young people challenged, the buck has to stop somewhere! A Strong Research Base. If we were to make a list of the fields of human knowledge that are the most enduring over the centuries and that have the highest respect among communities of scholars, that list would be directly related to the amount and quality of research associated with each field. A second long-standing goal so far as “the big picture” is concerned is that services for developing the gifts and talents of young people should rest on the strongest research base possible. Our field will not gain respect or support unless dedicated scholars are willing to take the time to study what they stand for. It is not accidental or coincidental that one of the nation’s most enduring and effective programs, the Johns Hopkins (and other universities) Center for Talented Youth is based on the most highly respected research that has been conducted in our field. We are also proud of the fact that every aspect of the SEM, whether it is an instrument to assess student learning styles (Renzulli and Smith, 1978) or the effectiveness of a specific practice such as Curriculum Compacting (Reis and Renzulli, 1992) or Enrichment Clusters (Gentry, Reis, Renzulli, Moran, and Warren, 1995), has been examined in one or more research studies; and these studies, like the Johns Hopkins studies, have been reported in the most respected education research journals. Unfortunately, our field has been the victim of far too many unverified practices. It is difficult to advocate for the value of special services or gain financial support without an underlying body of research that informs policy makers, administrators, and parents that a specified service produces results that have been documented in a research setting. A lack of research also makes the field vulnerable to almost anything being peddled by new-age gurus or seductive storytellers. This is not to say that there are not potentially good ideas that should be considered. But if persons offering such ideas do not have the veracity to provide us with some data about “what works,” then we will never know if the idea has merit, and a worse-case scenario is that we may fall prey to practices that are counter-productive. If we want to be gifted consumers, we must be bold enough to ask anyone who presumes to stand behind a podium the tough questions: Show me your research. Where can we find the data that supports what you are saying? Is what you are recommending based on replicable and verifiable practices? Can you give me the names and locations of numerous successful implementations? Is there evidence that what you are recommending works in different kinds of schools and in communities with varying demographics? If we want the field to grow and prosper, we must begin asking these tough questions. A Broadened Conception of Human Potential. Conceptions of giftedness range from specific and very focused viewpoints to broader and more flexible views of human potential. The specific and focused point of view is generally associated with assessment based on scores from cognitive ability tests (IQ, achievement, aptitude), whereas the more flexible approaches take non-test criteria into account in addition to those characteristics measured by standardized tests. A third goal of our work is to encourage everyone involved in gifted education to examine various theories about what makes giftedness (See, for example, Sternberg and Davidson’s landmark book entitled Conceptions of Giftedness). Where one stands on the “Who are the gifted?” question is essential in both constructing an identification system and providing a service delivery model that is logically related to conception and identification. The foundation of the SEM is a broadened conception of human potential called the Three-ring Conception of Giftedness (Renzulli, 1978, 1986). This research-based view of potential for high levels of performance and creative productivity is strongly supported by leading theorists, researchers, and contributors to the literature on both intelligence and giftedness. Such well-known scholars as Howard Gardner, Robert Sternberg, Mihaly Csikszentmihalyi, and Benjamin Bloom (to mention only a few) have all made compelling arguments for a much broader conception of giftedness. Also relevant to the conception of giftedness issue is where one stands regarding the purposes of special programs. In articles dealing with the Three-ring Conception, a distinction was made between lesson-learning giftedness (also referred to as schoolhouse giftedness) on one hand and creative/productive giftedness on the other. Both types are important, and a comprehensive programming model should provide services that accommodate both advanced academic progress in traditional curricular situations and various services specifically designed to promote creative productivity. Because of the central role that a broadened conception of giftedness plays in the rationale underlying SEM, it is strongly recommended that persons considering this model first examine and reach consensus on their position regarding the nature of human potential. If such an examination results in a more traditional view of giftedness (i.e., primarily based on cognitive ability test scores), then other service delivery models should be examined. If, on the other hand, the majority of persons in a school or district decide that a more flexible view of potential is commensurate with their beliefs, then a plan for identification and a programming model consistent with these beliefs should be explored. As everyone who has ever worked in the field is aware, there is no “perfect” identification system—each has its advantages and disadvantages, and there are always trade-offs that need to be made to bridge the gap between one’s theoretical orientation and practical requirements such as state regulations, resource availability, and strong opinions on the parts of parents and people in the power structure. The more flexible view of human potential will never produce an identification plan that is as precise and tidy as a test score cut-off approach. To be certain, there will be a little less tidiness in a more flexible identification process, but the trade off for tidiness will result in identifying and serving potentially gifted young people who seldom get a chance when administrative expediency overshadows what research and common sense have told us about the nature of human potential. Persons interested in exploring an identification plan that blends both test score and non-test score information are referred to an article entitled A Practical System for Identifying the Gifted and Talented (Renzulli, 1990). Educational Experiences Grounded in a High-End Theory of Learning. One of the major criticisms of the gifted education movement is that it consists of a collection of activities that lack a unifying theoretical foundation. A fourth goal is that a majority of experiences guided by the SEM should be based on a theory of learning that places a premium on inductive or investigative activity rather than accelerated information transfer and accumulation. This theory of learning has been described in detail in an article entitled The Definition of High-end Learning (Renzulli, 1999a), and includes a description of The Enrichment Triad Model, which continues to serve as the theoretical core of our work. It should also be mentioned, once again, that our concern for creative/productive giftedness is incorporated into the underlying theory. Advanced knowledge acquisition and the use of higher level thinking skills is important, but the real payoff so far as a high-end learning theory is concerned is the application of knowledge and authentic methods of inquiry to first-hand investigative activities and the pursuit of creative endeavors. Related to this assumption is the interconnectedness of services provided by the model. Thus, for example, a presentation on fashion design or depletion of the ozone layer above the Earth (Type I Enrichment), or training in brainstorming or how to design a questionnaire (Type II Enrichment) are valuable experiences in and of themselves; but the best payoff from such activities is maximized when individuals or small groups decide to follow-up these general enrichment experiences with self-selected investigative and creative involvements that are guided by the specification for Type III Enrichment. Even Curriculum Compacting, that part of SEM that accommodates students who can cover material at accelerated levels, plays into the enrichment end of the model by allowing advanced students to “buy time” for possible Type III investigations. Since the learning theory underlying this work is readily available at our web site, I will not spell it out again here. It is, however, worthwhile mentioning that all persons involved in gifted education should examine where they stand on issues related to the nature of learning in general, and in particular, the differentiated principles that should guide learning in special programs for persons with extraordinary potential. Indeed, the very essence of our field should be grounded in the ways in which we define differentiation and the principles that form our theories. Common Goals and Unique Means. A final goal is that a model should possess certain identifiable dimensions based on common goals and unique means for achieving these goals. Programs for the gifted that have consistently produced demonstrated results and that have endured over relatively long periods of time have almost always been based on a specified model. Before describing what makes a model a model, it is worthwhile pointing out that there are two categories of models that guide special services, these categories being theoretical (or pedagogical) models and organizational (or administrative) models. When most people are asked what “model” is being used to guide their special program they almost always answer in terms of organizational models. Although we believe that both types of models play important roles in guiding program quality and effectiveness, theoretical models should be the first and most essential consideration in program planning. Theoretical models consist of the principles and derivative experiences and activities that are designed to accomplish particular kinds of learning. Theoretical models usually draw upon the work of leading philosophers, researchers, and learning theorists, and they are located somewhere on a continuum of learning theories ranging from highly didactic or prescriptive learning on one end to highly inductive or investigative learning on the other. The work of Pavlov, Thorndike, and Skinner are examples of didactic theories, whereas inductive or constructivist theories are represented by writers such as Dewey, Pestalozzi, Piaget, and Montessori. Theoretical models should be the first and most important consideration when examining the quality of services for gifted students, and we have briefly summarized in the section above the high-end learning theory that underlies the SEM. Organizational models are concerned with how we group students, move them around between and among various service delivery options, plan schedules and events, allocate time blocks, assign teachers, and do other things that contribute to the efficient and effective use of student time and human and material resources. Examples in this category are pullout programs, full-time special classes, cluster grouping, after school programs, Saturday programs, grade skipping, advanced classes, college courses, special schools, and differentiation in the regular classroom. Organizational models are obviously important, but they do not tell us why, what, and how we present learning experiences within any of the organizational models mentioned above that are qualitatively different from the learning experiences that take place in regular education.¹ A special class for gifted students could, for example, be very didactic or prescriptive in its approach to learning, or it could be an environment in which students engage in self-selected investigative activities using the authentic methods of practicing professionals, even if their methodology is at a more junior level than adult scientists, writers, or other professionals. The most important consideration is that students in the special class are thinking, feeling, and doing what real world investigators and problem solvers do as opposed to being consumers of knowledge who are mainly involved in accumulating information and practicing thinking skills, albeit at a faster level. The same theoretical distinctions can be made for all of the types of organizational models listed above. It’s not when or where we do it, or even with whom we do it. The key issue is how we do it! We believe that what makes a model a model is that the services provided are based on sound theory and research, that it is replicable in a variety of situations, and that it is capable of generating outcomes that can be evaluated by independent investigators. We also believe that to be effective a model must have two salient features. The first feature is that there should be consensus about the underlying learning theory and service delivery procedures on the part of the majority of persons who are responsible for providing services. Without agreement on common goals, persons providing services can do whatever they want to do, and this approach may end up with people actually working at cross-purposes with one another. The second feature of a model is that each school or program develops its own unique means for delivering services, so long as the means are consistent with the agreed-upon underlying theory and common goals. This feature prevents models from becoming too prescriptive, and at the same time, allows the creativity of program personnel and the availability of unique local resources to be brought to bear on the program. It also allows for program modification and renewal, and the infusion of new ideas and resources, so long as any and all modifications are compatible with the goals of the model. Bloom, B. S. (Ed.). (1956). Taxonomy of educational objectives handbook 1: Cognitive domain. New York, NY: David McKay. Bloom. B. S. (1985). Developing talent in young people. New York, NY: Ballantine Books. Csikszentmihalyi, M., Rathunde, K., & Whalen, S. (1997). Talented teenagers: The roots of success and failure. New York, NY: Cambridge University Press. Gardner, H. (1983). Multiple Intelligences: The Theory in Practice. New York, NY: Basic Books. Gentry, M., Reis, S. M., Renzulli, J. S., Moran, C., & Warren, L. (1995). Enrichment clusters: Using high-end learning to develop talents in all students (Video Set V955). Storrs: University of Connecticut, The National Research Center on the Gifted and Talented. Reis, S. M., & Renzulli, J. S. (1982). A case for the broadened conception of giftedness. Phi Delta Kappan, 64, 619-620. Renzulli, J. S. (1978). What makes giftedness? Re-examining a definition. Phi Delta Kappan, 60, 180-184. *Renzulli, J. S. (1986). The three ring conception of giftedness: A developmental model for creative productivity. In R. J. Sternberg & J. Davidson (Eds. ), Conceptions of giftedness (pp. 332-357). New York: Cambridge University Press. *Renzulli, J. S. (1990). A practical system for identifying gifted and talented students. Early Childhood Development, 63, 9-18. *Renzulli, J. S. (1999a). The definition of high-end learning. Storrs: University of Connecticut, Neag Center for Gifted Education and Talent Development. Renzulli, J. S. (1999b). Reflections, perceptions, and future directions. Journal for the Education of the Gifted. 23(1), 125-146. Renzulli, J. S. (2000). What makes giftedness: Reexamining a definition. In R. Diesner & S. Simmons (Eds. ), Notable selections in educational psychology (pp. 373-384). Guilford, CT: Dushkin/McGraw-Hill. Renzulli, J. S., & Reis, S. M. (1997a). The Schoolwide Enrichment Model: A how-to guide for educational excellence. Mansfield Center, CT: Creative Learning Press. Renzulli, J. S., & Reis, S. M. (1997b). The Schoolwide Enrichment Model: New directions for developing high-end learning. In N. Colangelo & G. Davis (Eds. ), Handbook of gifted education (2nd ed., pp. 136-154). Mansfield Center, CT: Creative Learning Press. Sternberg, R. J. (1985). Beyond IQ: A Triarchic Theory of Human Intelligence. New York, NY: Cambridge University Press. ¹ Covering more material faster is a quantitative rather than qualitative difference in learning. Rapid coverage of larger amounts of material certainly has value and should be an option in special programs, but the pedagogy and the role of the learner generally are the same as in regular education.